Chilgrove Dry Gin will rock your next craft cocktail in style. Chilgrove Spirits is the brainchild of Christopher Beaumont-Hutchings and his wife Celia. Celia was born in The Hague to a Dutch mother and proper British father, so was exposed to both Jenevers and Gins a’plenty. They founded their small batch distillery in Chilgrove, Sussex, England — thus the name — and released their signature Gin to the masses in 2014. A year later, they added a lovely Vodka to the line up. 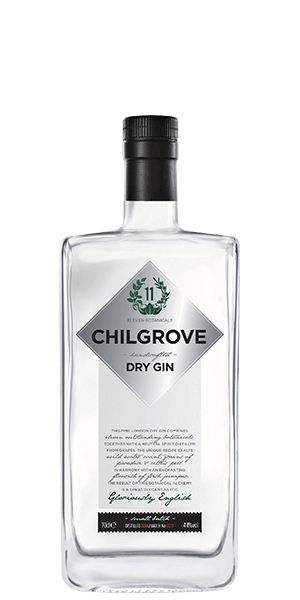 Chilgrove Dry Gin is a bit of a rarity in that it is not based on grain. It starts with a grape-based spirit. But back in the early days of Gin and Jenever, this was the standard. A few hundred years ago there was a protracted cold period that wrecked havoc on the grape crop. There was barely enough eaux de vie for Wine and Cognac, so local distillers turned to grain and potato. That’s a shame, because grape spirit has a naturally richer mouth feel and a light, ethereal fruitiness that makes it shine when distilled. Chilgrove knows this and combines this rich spirit with 11 botanicals, including citrus zest, local florals, angelica root, coriander seed, grains of paradise, and wild water mint, among other bits. Any way you slice it, this Gin makes the grade with a top-notch flavour profile. And if you are the kind that likes to count awards, this Gin has garnered six from the top shows. What does Chilgrove Dry Gin taste like? The Flavor Spiral™ shows the most common flavors that you'll taste in Chilgrove Dry Gin and gives you a chance to have a taste of it before actually tasting it. Few Gin Distillers Make Their Own Alcohol. Gin usually starts with neutral spirit: A commodity that in distillers buy in bulk. It’s what the distiller does with this commodity in the flavour-infusing process that makes each Gin different. There was a period from about 800 to 1200 AD where the global temperatures were a bit warmer — expanding the grapes growing regions up into Britain. Then there was a colder phase called the Little Ice Age that lasted well into the 1800’s. Grapes got harder to come by and Europe started distilling grains and other starches to compensate.